RJ has been my crazy excitable BFF since she joined the beta team for the original version of Sage three years ago. I’ve been delighted to encourage her along her writing journey, because she’s a gem and I saw true potential in her writing. Her passion seeps through every page with awesome characters and creative worldbuilding. Now her hard work and potential have been unleashed in the launch of the first book in her Stones of Terrene series, Renegade Skyfarer. I wrangled RJ for an exclusive interview, which you can find below along with my honest review. Yes, I’m biased, but seriously, this book series is epic. (I’ve already beta-read the next book in the series, and voidborn whales, it’s good.) And see below for a giveaway of a signed paperback and your invitation to a Facebook launch party where I’ll be guest-hosting and throwing my own giveaway! 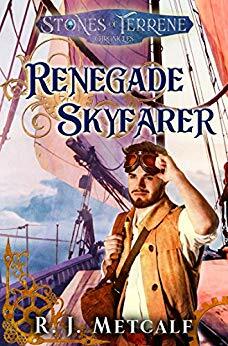 Renegade Skyfarer mixes classic fantasy with steampunk in a unique world with awesome characters. You’ll soar on airships, fight dinosaur-inspired dragons, cheer for adorable romances, and uncover political secrets and plots in this epic new series. It’s clean! I find it so nice not to be berated with cursing and unnecessary sexual scenes, and I can recommend it to teenagers without any worries. Plenty of humor, because who doesn’t love a good laugh? It can get pretty bloody in the fight scenes, and one scene is particularly gruesome and jarring. But it definitely serves its purpose in the story, so it’s not thrown in there for no reason. The descriptions didn’t bother me, but I can see how someone who’s sensitive to such things might cringe. But really, if you’re used to reading this genre, you probably won’t even blink. Offensive language: None. There are replacement curses or exclamations like “whales!” or “…from the void!” Nothing too close to real-world cursing. Sexual content: Nothing beyond innocent first love and awkward flirtations, but there is a brief scene revolving around the villain that hints at a sexual act. The next book in the series will deal with choices around a political marriage. So the situations can be serious and a little spicy, but the bedroom door is always closed. Violence: Strong. Some of the gore is bordering on gratuitous, but I’d say it’s more realistic descriptions than unnecessary. It’s gritty and raw, but not overly disgusting for no reason. Probably on the same level as The Lord of the Rings movies or a vivid history book. Highly recommended for fans of sci-fi and fantasy. It’s clean, but recommended for ages 14+ for graphic scenes and mature situations that arise later on in the series (still clean, though!). While I feel like it’s meant for teens and young adults, I’m sure plenty of adult lovers of classic fantasy would love it as well! 1. The dragons in Renegade Skyfarer seem similar to real-world dinosaurs, but with magic! What inspired your fantastical creatures in the world of Terrene? Well, they were Mike’s idea to begin with, but now we have a pack of dinosaur flashcards, and I’ll randomly sort through them, and come up with their abilities, and new name and such. Sometimes I’ll post on my Facebook account and ask for new ideas. It all falls under the idea of Terrene being populated after the Biblical flood. What if all that death sucked people into a new world, where there’s a spark of magic? So all people, all creatures, all living things have some sort of spark to them when natively born there? It’s a fun idea to play with. 2. One of my favorite aspects of Renegade Skyfarer is the forbidden romance. Are there any other books, movies, or TV shows that inspired this relationship? Ooh. Good question. I don’t think I’d ever really thought about it as something that’s been inspired by other works, really. It just fit the characters… and I ship them, so I had to run with it. *laughs* Maybe to a small degree, the relationship between Richard and Kahlan in the Sword of Truth series? Now, I fully admit that I’ll watch/read other romances that give me ideas on how to dial up the electricity between these two when needed. But, really now, they write themselves quite well. 3. The airship, The Sapphire, has intricate descriptions regarding her steampunk components. Where did you find such details for writing her mechanics? My dad is a mechanical engineer, so I grew up hearing how parts worked, and listening to some of his friends talking shop. So the Sapphire was already a bit familiar to my brain. Then I took it a step further and spent an afternoon with my dad, hashing out the engine room, what parts I was planning to be based off the magic stones, what parts were mechanical, how they’d work, what they’d need, what would need to be worked on, etc. I have a drawer full of sketches on papers and napkins as dad and I discussed all the different ideas, and what would fit, where, and why. 4. 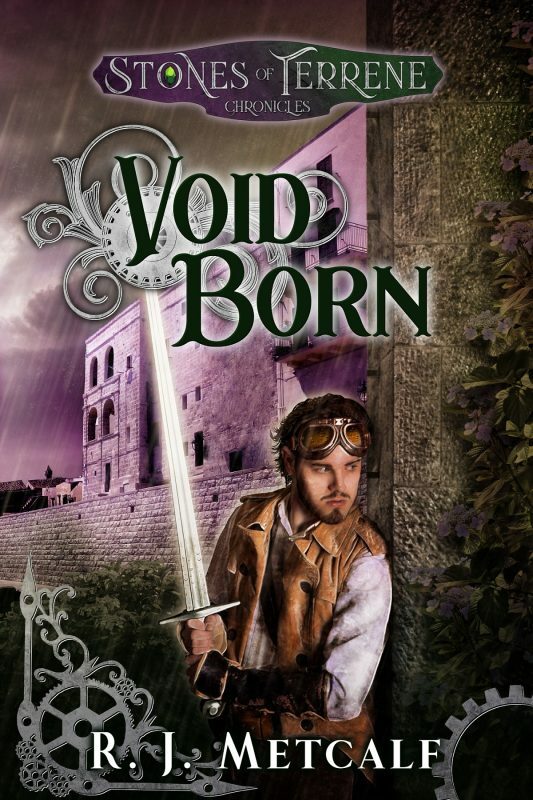 Can you share any juicy tidbits about the next book, Void Born? *waggles eyebrows* What juicy tidbits are you looking to know? Hmmm. I reckon I can tell you that by Void Born, Ben knows where he’s from, and his goals change appropriately. Things start to heat up for Jade in regards to her position of authority, as well her relationship with Zak. And the barrier? Well, I greatly enjoy the mashup with ‘Skyfall’ while I work on Void Born. Calling all book lovers! Join authors RJ Metcalf, S. D. Grimm, and Jamie Foley as we chat about RJ’s debut fantasy novel, Renegade Skyfarer, on July 6th from 8 PM to 10 PM EST (7 PM CST and 5 PM PST). Grab your favorite drink and snack and be prepared for a fun time of chatting with RJ, games, and giveaways. Join the fun on Facebook! 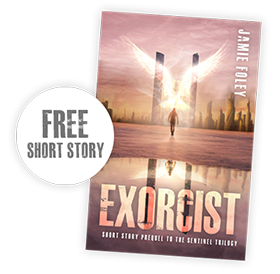 Other Books in "The Stones of Terrene"
Get the email newsletter for an exclusive free short story: Exorcist, the prequel to The Sentinel Trilogy. Plus giveaways, reviews of awesome fantasy and sci-fi books, beta team invitations, and behind-the-scenes goodies!